This technical validation shows that our solutions and applications meet the IBM integration criteria for Cloud and Smarter Infrastructure solutions. Utilize the company resources right with a fast backup and a fast restore. Data Protector allows you to do fast, hot online backups and works especially well in networks with low bandwith. After a full backup has been taken, an incremental backup handles the changes that has occured to the database. This is a very efficient technical solution that saves your company time, money and energy, as the backup window is minimal. 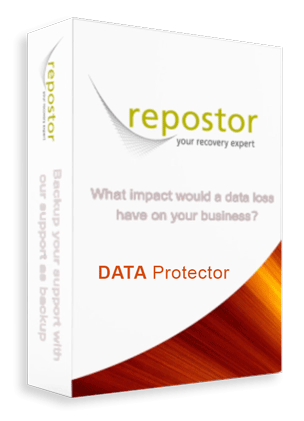 Data Protector takes backup on block level and is very flexible and easy to work with. This product works on FirebirdSQL, Ingres, MySQL, PostgreSQL, Progress Open Edge 4GL, Sybase ASE, Sybase IQ and MariaDB. Read more about the databases Data Protector supports under ‘Technical specifications’. Evaluation license: 30 days trial after downloading the software. Repostor has two different payment models, available for all products, one Subscription model and one Licensing model. Choose the model that fits best for your company. Read more about the subscription model here. For bigger companies where a shutdown has a high impact on business profit. Snap Protector uses a similar but more advanced technique. The first backup is also on the entire database, and after that it only takes a backup on the changes in the database. The difference is that this backup is even more précis and faster. Every change in the database is directly backed up to Spectrum Protect, which gives your company a nearly continues backup. The backup is therefore the safest alternative for your company, and is even more cost effective and time efficient. This product is preferred to bigger databases with a Linux platform and works on MongoDB, MariaDB, MySQL and PostgreSQL. Read more about the databases Snap Protector supports under ‘Technical specification’. Reposter is an IT company that specializes in developing backup and recovery solutions. We are a born global business with customers and resellers all over the world. Our vision is to become the preferred choice for business continuity.